As most of you know, I am leaving Pt England School this year to set off on my big adventure to England. I am very sad to be leaving all of the beautiful and smart kids at PES, but at the same time excited to keep up with all of your blog posts in the holidays and new year! 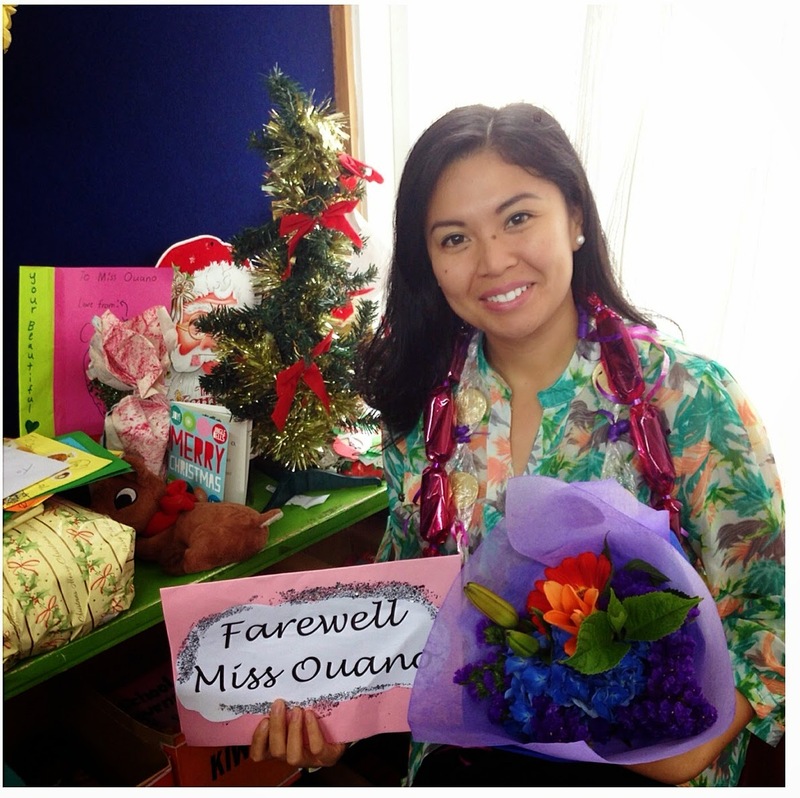 Thank you for making me feel at home Pt England School, goodbye for now! LI: I am learning to plan and write Haiku Poems using the 575 rule. Haiku poems are Japanese poems that are meant to paint pictures in your mind. They are written to describe and talk about nature and feelings. Haiku describes the place/environment, sounds, smells, people, action. 3. Make sure with our teacher we were allowed to record in a quiet place. After we had done that, we posted it to our blog's. You never know if we are doing a video of this! So watch out for the video. On friday class ten, nine and some of the other year five kids from class six traveled to the art gallery.When we where on the bus to the art gallery the bus was full of excitement. As soon as we got there we jumped off the bus and walked to the entrance. Then the parents when talking about our sessions. I will tell you more about our sessions on the other paragraphs. When it was our first session it was our gallery tour. If you do not know what it means it means all groups got a lady that gave us a tour around the gallery. In my group we had a lovely woman named charlotte. She took us to look at how a picture tells a story. After that every group went to were we usually meet. Then we have our break. When our break got completed our class (class 10) went with Mandy to the studio. Did you know that the studio was my favorite room. It was so fun, but what we actually did was telling a story in our paper jar. Afterwards it was our second break and it was just like our first one. Just as our break was done this was the part when we have our free time. That was the part when we get to do the lego and the learning center. Then we split up into our groups but my group went to the lego first. Towards the end of our lovely trip we had to meet where we always meet to hop on the bus, and get back to school. While we where on the bus boys were on in the front of the bus, and girls were at the back of the bus. Next time if you go to the Auckland art gallery and you see more about it you have to tell me about your trip there. Wow what a great day at the rotorua museum where I got to see all kinds of places and history, like art galleries, Maori history and I went to the cinemas in the museum to see what it was like in 1886.It was really fun exploring all the fun things a facts about the first world war, Maori tribes and volcano eruptions.My favourite thing about the museum is that in 1886 there was a huge volcano eruption it was awesome to see the huge eruption but tragic to see the people who were dearly loved and had died. My parents and I went from door to door looking at the old baths that were in the rooms.In each bathroom the baths were quite dirty and had a hole in it.The only reason why is because it happened when the bath house was shut down.I actually liked that the baths were dirty and they had holes because it just has that feeling from when it actually happened and that was pretty cool.The baths were used for healing ill people and sometimes filled with mud.In one of the videos that I saw at the museum a man had filled a bath tub with mud a another man was in it.The man in the bath tub was healing in the mud while the man that had filled the bath tub was standing there with a clip bored and was writing a few things down.It was almost like he was experimenting on the man in the bath tub. The next room my parents and I went was the Maori history room.That is where I watched a short movie about Hinemoa and Tutanekai. The movie was spectacular,it was all about how their love was forbidden and Tutanekai was a mistaken child from god but he was a gifted child who worked hard but had moved away.When Tutanekai and some other men who were getting ready to leave that is when Hinemoa fell in love with Tutanekai and that is also when Tutanekai fell in love with Hinemoa but he still had to go.After a couple of months Hinemoa’s father the chef noticed that Hinemoa had fallen in love with Tutanekai but the chef wanted Hinemoa to marry someone else. So what he had done was he had got his men to hide all the cones so Hinemoa can’t go to Tutanekai. But one night Hinemoa leafed and swam to Tutanekai.She stopped at a island were in the water she was resting,but someone had caught her and called one of the most strongest men,that was Tutanekai.Tutanekai reached into the water and tried to find Hinemoa but he did not know it was Hinemoa. Once he got her he pulled her out of the water and there she was.Tutanekai was more happy than ever to see hinemoa and hinemoa felt the same and that is the story on Hinemoa and Tutanekai. Wow what a great story I absolutely loved it but as what we had to do is go so we went to visit the art gallery.That is when I saw the most beautiful kete, it was woven so beautifully and it looked amazing in it’s glass case.I loved it I just felt like taking it but the kete was locked in its glass case.Well that is all I did at the rotorua museum and I hoped you like my story about Hinemoa and Tutanekai also all the other things that I wrote about.Have you been to the rotorua museum? Imagine... you have been learning all day, you are starving, and then you find there is only one apple left! What are you going to do? Well lets see an example of what could happen! Starring Christian, Talita and Desmond. Boys and girls, ladies and Gentlemen prepare to be amazed by class ten’s hilarious film. Reading Waimaria from Team 4 Pes on Vimeo. We read an Article about Regan Gentry's art. Our learning task was to create an interview with questions and answers for Regan. Watch the video to see more! Task Art Attack - What's going on? Using well known artists from the impressionist era, you are going to contribute to a group animation showing what could be happening in front of these art backdrops. You need to show your understanding of the artist's work, it's setting and time in history through the animation you create in the foreground. mya's story from Team 4 Pes on Vimeo. Alisha's Art Attack animate from Team 4 Pes on Vimeo. Waimaria from Team 4 Pes on Vimeo. The yellow house from Team 4 Pes on Vimeo. Vincent vangogh by Rima from Team 4 Pes on Vimeo. My holiday was great but the first day of the holiday…… not my favourite. If you’re wondering why it was not my greatest day ever here is why. When you’re sitting in a bus for 11 hours and then hop on another bus for about two hours just to go to Masterton how would you feel? The people that were travelling with me to Masterton was my cousin,my brother and my nana. 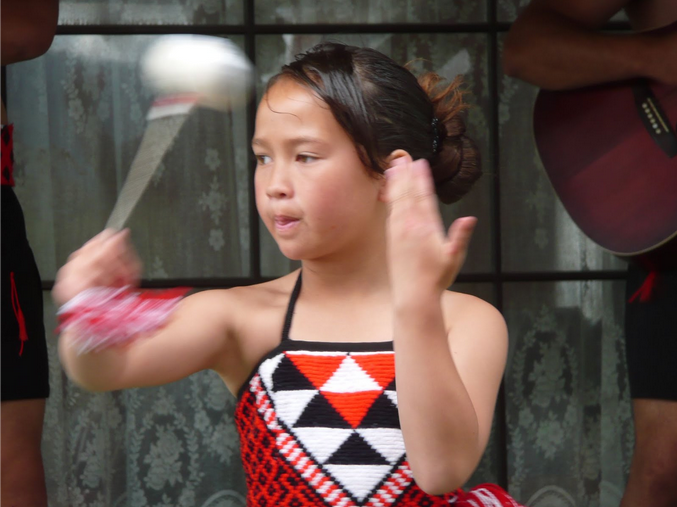 At masterton I was staying with my cousins,nanas and Aunty. It was a very tiring trip but we made it all the way. In Masterton we did a lot of things. Long story short we did swimming, cooking, playing and had fun with the family. 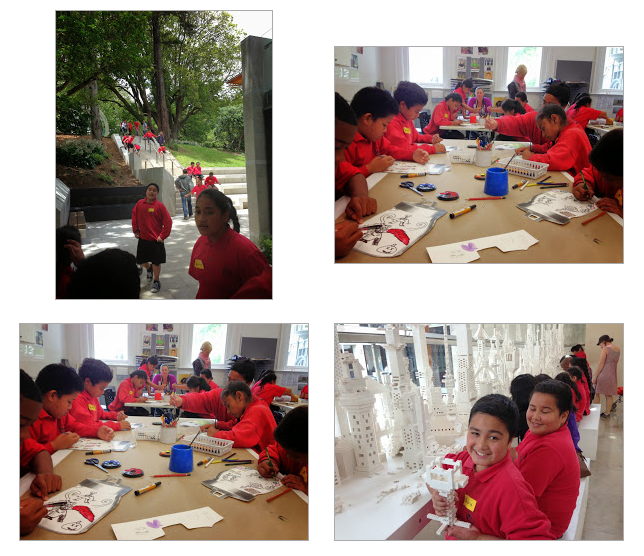 It was a busy week, but at the same time it was fun and exciting to learn how they do things in Masterton. My family and I is from Bangladesh. In my culture we celebrate something called Ead it is when girls and boys gets to show of their new clothes. My favorite part is when adults give money to kids, after that it will be our decision to save it or waste it. What would you do with the money? Samoa is a nice cooling place to be. Sometimes we do spearfishing in the shallow waters. In Samoa we do like swimming in the water and it is so clear to swim in. Rima magle from Team 4 Pes on Vimeo. This is a game that I invented please enjoy!!! The commonwealth event that was made five weeks ago, was invented by Rima. As you all know the event is called marble golf or magel. My Event is golf but I used marbles instead and my fingers instead of the golf sticks. The aim of the game is to get all your marbles inside the hole. You will need two marbles for each person. You will also need to make a hole in the ground. It has to be held in a field or a place that has grass, so that you can make a hole. If it is held on concrete the game will be different. There can be two players or more but if there are two the game will end fast and you will also have fun. The rules are to have fun no cheating and you can't get the players marbles in unless you finish yours. And if you do you will be out. Franz Ferdinand was shot by a crazy man, he was in his car with his wife at this time. Lots of people mostly soldiers were going for the crazy man and lots of people were going for Franz Ferdinand. This is how the war began. That shot was called "the shot that echoed around the world”. It was a really sad shot, but our soldiers fought in the war for us. For us to remember there is a saying it’s "lest we forget". We must remember people who fought for our country. The troops of New Zealand and of Australian were called ANZAC's. We wear poppy to remember them. Some of the names are written on the wall in the Auckland museum. I know one of them, he was my Papa. We have been learning how to use the text we have been reading and other websites help us gather information about a city or country. 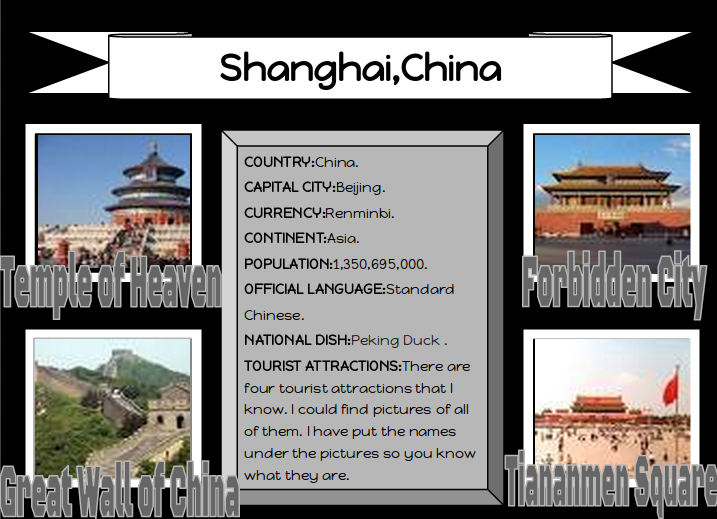 In my group in class, we are learning about Shanghai,China. Culture's are what makes countries unique.Each countries has different activities culture rituals Culture are seen in writing, religion, music, clothes, cooking and in what they do. Culture also includes how people understand the world and their own life. Different Countries have different cultures. My Family is Culture is Muslim. In My Culture When they turn ten years old they gold they bracelets, necklaces, earings. In my culture when girls turn ten years old they have to wear head scarf.